Print HAVE YOU EVER HAD A BAD SKIN DAY? Today’s lifestyle can cause havoc on our skin. External factors such as travelling, air conditioning, seasonal changes, pollution or late nights, as well as internal factors such as fatigue, stress or hormonal cycles, can all have an impact on your skin appearance. These internal and external factors can sometimes result in your skin feeling and looking “different” causing a “bad skin day”. Bad skin days can affects women whatever the age or skin type. It’s time to say bye-bye to bad skin days as we introduce the Advanced Génifique Sensitive Dual Concentrate, our night skin saviour. A freshly Activated Dual Concentrate serum that will help soothe your skin whenever you feel it needs it. The face serum is enriched with the same ingredient as our iconic Advanced Génifique Serum – ferment extract, bifidobacterius extract as well as a lactobacillum ferment extract. In addition to these ingredients it contains an additional concentrate enriched with Vitamin E and Ferulic Acid. Freshly mix the two formulas together. 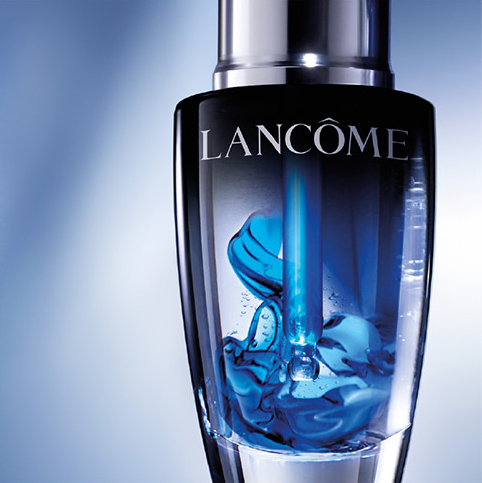 Push and twist the cap to release the blue concentrate into the base serum concentrate. Shake until the two concentrates are evenly mixed. Use Advanced Génifique Sensitive Dual Concentrate when you‘re experiencing bad skin days or when your skin needs it most every night for one month. The 2 formulas freshly mixed in 1 product create our skin saviour. Lancôme’s latest skin serum will help to leave your skin feeling less dry, more comfortable and soothed so you can say bye-bye to bad skin days! Once activated, please use the serum within two months. The perfect pair! Apply Advanced Génifique Sensitive face serum every night during your bad skin days and combine it with our #1 serum Advanced Génifique by applying it every morning before moisturising. Print Immediately, your skin feels more comfortable and the appearance of dryness is reduced and it feels soothed. The formula helps to leave skin feeling smoother and look more radiant. Print The perfect pair! Apply Advanced Génifique Sensitive every night during your bad skin days and for best results apply our #1 serum Advanced Génifique every day. Print Serum with a fresh, plump, and easily absorbed texture. HOW TO FRESHLY ACTIVATE THE PRODUCT? to up to 2 months! EVER HAD A BAD SKIN DAY? at least one bad skin day in your life!